They date from June 1942 to June 1945—three years of a life interrupted by the Second World War. They’ve held up surprisingly well, given they are more than 70 years old. They’ve survived scorching summers and frigid winters in various attics, as well as several moves, but they did not survive their author, my father. 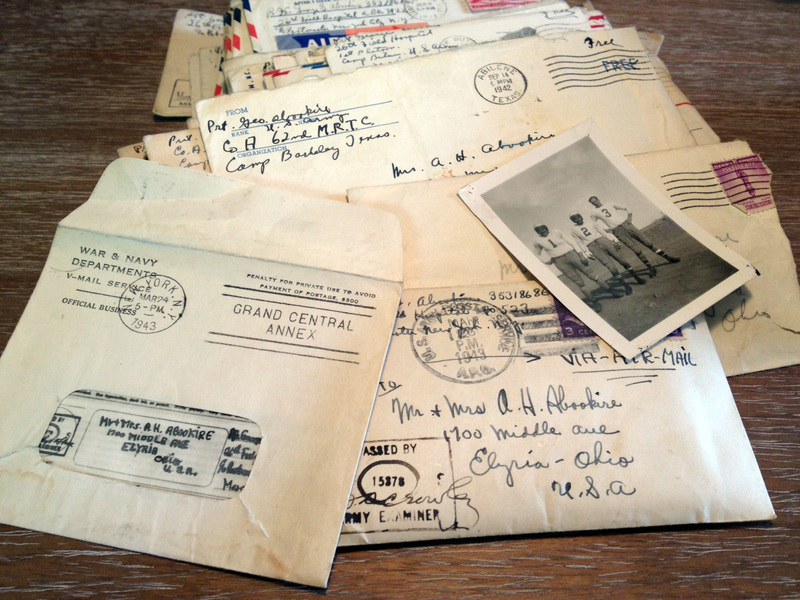 His letters home to his parents, who owned a small grocery store in Elyria, Ohio, begin and end in June, which would also be the month that he died, in 1969, when I was 13. I’m 58 now, and it has taken me 14 years—ever since I found them in my mother’s attic after her death—to get around to reading them. Filled with bravado and fear, boredom and enthusiasm, pride in his country but a keen longing for home, they are, other than photographs, the only tangible artifacts that I have of my father’s voice and personality; very few people who remember him are still alive. I’m finally getting around to reading these letters because I’m writing a memoir inspired by my father’s absence, and by his interrupted influence on my life. You might say that I’m finally getting to know him. Private First Class George G. Abookire was stationed in the Middle East with the U.S. Army’s Persian Gulf Command—a stroke of more than good luck. His posting was a deliberate tack by his commanding officers, since my father could speak Arabic fluently. A first-generation American born in Elyria, where his parents eventually settled, his father was born in Beit El Dine, Mount Lebanon, an area of Syria that would, after the First World War, become what is now known as Lebanon. His mother was born in the neighboring village of Deir El Amar. Both villages were located near the cities of Zahle and Beirut, and when I was growing up my grandparents defined themselves as coming from Zahle. (Rather like people from Elyria saying that they’re from Cleveland.) That I have this information at all is the result of much diligent work and research by several of my father’s first cousins, and—surprisingly enough—his Polish nephew-in-law, who has an abiding interest in genealogy. Try and not work too hard Ma as I don’t want you to. I’d like to see you & Pa on a vacation this year & if its up to me you’re going to have it. Life here is simply grand & wonderful to be in. I can’t find words for it Ma. You’ll have to see it yourself. It’s a different world all together here and I just about wished I were born here…. The studying is terrific. You really have to study to keep up with the awful large amounts of work they give you. Anatomy, Physiology, Pharmacy & bacterial media. It’s fun though…. Tuesday night…just got off kitchen duty. I had 11-1/2 hours of it & we just scrubbed every thing after each meal. I’m in the tent now writing by flashlite [sic] smoking a R.G.Dun that you sent me. Truthfully Dad the army was tough over where we were at but somehow I managed to overcome it but this out here on the edge of the camp is something else to swallow. We have no toilets. Just a wooden shed & room for 10 or 12 & you can smell it way over on this side of the road as our tent is the last one on the end from Headquarters. As I told Ma we had a miniature hurricane here Sat. while we moved. Our raincoats saved us but our feet & hands froze & we had to set up new living quarters (tents) kitchens & dig ditches & all in all that rain. One fellow in our Co. caught pneumonia & died yesterday. This life here is so tragic & unbearable I don’t see how I’ll take it. 2 of the boys here went A.W.O.L. Sunday. I went to the show & walked around about 6 miles in camp.…We have no lights … we’re not even to go to the toilet at night. We shower in cold water & then we only have 3 faucets for over 300 men. The experiences at Camp Barkeley, where my father is a member of Company A, 62nd M.R.T.C., underscore not only how challenging all of this soldiering will be, but also how the Army is still building from scratch. His reference to “living on borrowed time” suggests a familiarity with the real horror of the unknown. Reading these letters with the benefit of history and hindsight—we know how the war will end, and I know that my father will survive it—emphasizes their in-the-moment nature. He doesn’t know his fate, nor do his “buddies” in the camp. I never thought of that before. On past Memorial Days, when I’ve thought of my father as an army veteran—a member of Tom Brokaw’s “Greatest Generation”—I thought of him in his uniform, thrilled by the adventure of it all, proud to do his part for what he calls, in a subsequent letter, “the good ol’ U.S. of A,” and visiting family in Lebanon while stationed in Iran. It never occurred to me to consider what had to come before the neatness and the pride and the adventure: hard, back-breaking work in the constant rain, and the fear of an unsettled life. My father in uniform during the Second World War. 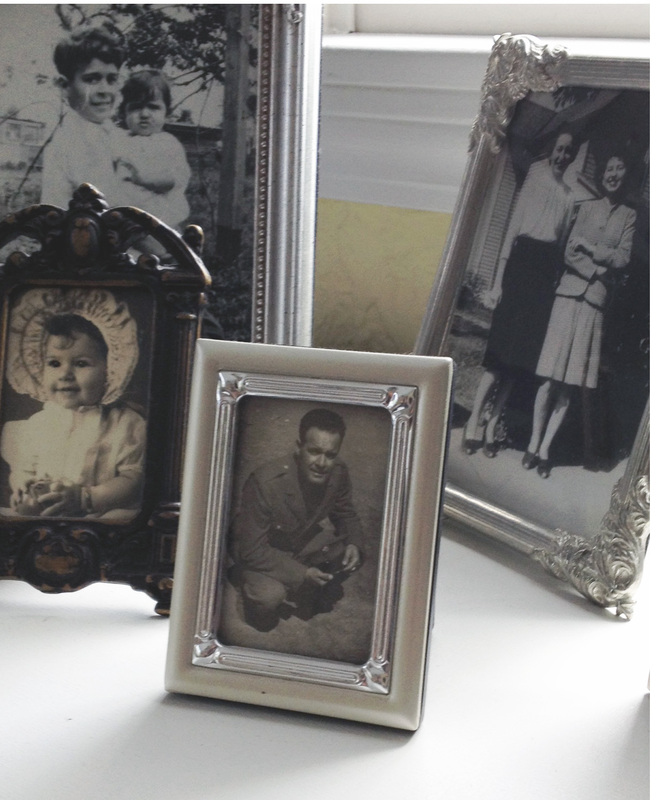 The photo in the rear, to the left, shows him as a young boy holding his baby sister. Included in the photo of his letters (above) is a picture of him in football gear with two of his buddies from the medics. He’s in the center.